There are more data sources than ever. Just googling a search term may not be sufficient, as the googled data may be inaccurate and/or biased. You want to avoid making important business decisions based on unreliable data. So which data sources should you use? We’re here to help you navigate them all. Read on for a quick breakdown of secondary and primary data and tips for finding valuable insights for your market research needs. 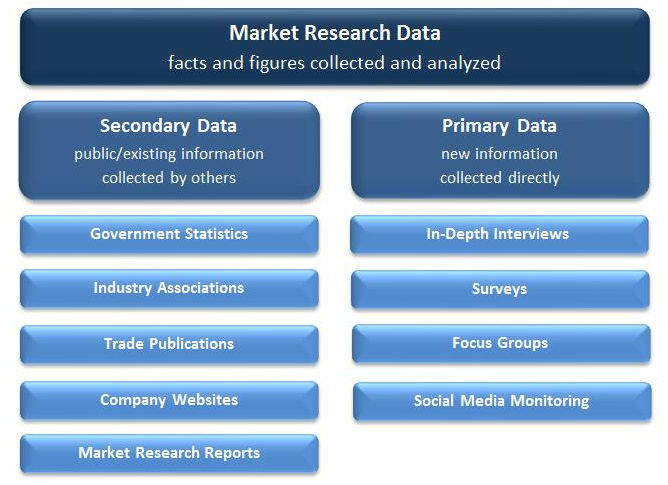 At the highest level, market research data can be categorized into secondary and primary types. Secondary data is public information that has been collected by others. It is typically free or inexpensive to obtain and can act as a strong foundation to any research project — provided you know where to find it and how to judge its worth and relevance. Government statistics are widely available and easily accessed online, and can provide insights related to product shipments, trade activity, business formation, patents, pricing and economic trends, among other topics. However, data is often not presented explicitly for the subject you are interested in, so it can take some manipulation and cross-checking of the data to get it as narrowly focused as you’d like. Industry associations typically have websites full of useful information — an overview of the industry and its history, a list of participating companies, press releases about product and company news, technical resources, and reports about industry trends. Some information may be accessible to members only (such as member directories or market research), but industry associations are a great place to look when starting to learn about a new industry or when looking for information an industry insider would have. Trade publications, such as periodicals and news articles, most of which make their content available online, are an excellent source of in-depth product, industry and competitor data related to specific industries. Oftentimes, news articles include insights obtained directly from executives at leading companies about new technologies, industry trends and future plans. Company websites can be virtual goldmines of information. Public companies will have investor relations sections full of annual reports, regulatory findings and investor presentations that can provide insights into both the individual company’s performance and that of the industry at large. Public and private companies’ websites will typically provide detail around product offerings, industries served, geographic presence, organizational structure, sales methods (distribution or direct), customer relationships and innovations. Published market research reports are another possible resource, as anyone who’s ever googled the name of the industry they’re interested in and “market research” can tell you. For a fee, they can provide a great overview of an industry, including quantitative data you might not find elsewhere related to market size, growth rates and industry participant market share. The downside is that you might not be interested in an overview — you might be interested in a niche, and that niche is only discussed on three of the report’s 300 pages. With all these sources of secondary data, you should be all set, right? Well, maybe not. If you are interested in a niche product or a new technology, there may not be a lot out there in the public sphere. The most current information you can find might be a few years old. You might not be sure if the material you found online reflects an accurate portrayal of the whole industry. You might be asking a question no one’s ever asked before, let alone answered. Now what? Now it’s time for primary data, new information collected specifically for your purposes, directly from people in the know. Methods of primary data collection vary based upon the goals of the research, as well as the type and depth of information being sought. In-depth interviews present the opportunity to gather detailed insights from leading industry participants about their business, competitors and the greater industry. When you approach a company contact from a position of knowledge — thanks to all that secondary data you’ve already collected — you can have a free-flowing conversation about the topics of interest. You can guide the conversation toward your research objectives, but also allow yourself to be led down unexpected paths by interviewees — some of the most valuable insights are the ones you didn’t know you should be looking for. If you’re seeking data you can quantify, surveys are an excellent way to collect a large amount of information from a given population. Surveys can be used to describe a population in terms of who they are, what they do, what they like and if they’re happy. You can then forecast the population’s future behavior in light of these identified characteristics, behavior, preferences and satisfaction. Surveys yield the most meaningful data when they ask the right questions of the right people in the right way, so care should be taken both to develop survey questions respondents will find relevant and interesting, and to determine which method of conducting the survey (online, telephone or in-person) is most appropriate. Looking to get consumers’ thoughts on a new product or service offering idea when you’re in the early stages of the development process? A focus group can get a small group of people that fit your target demographic in a room to discuss what they like, dislike, are confused by, would do differently — whatever. The group’s leader encourages honest, open discussion among participants, collecting opinions that can further direct your development efforts. Prefer to eavesdrop rather than ask questions outright? Social media monitoring can help you keeps tabs on candid conversations about your industry, your company and your competitors. How much are people talking about your brand compared to competitive brands? Is what they’re saying positive or negative? Is the public clamoring for something the industry currently doesn’t provide? How are your competitors portraying themselves via social media, and what does that say about their strategy? Social media monitoring shows that you don’t always need to participate in the conversation to learn from it. Overwhelmed yet? Here are a few of the ways our team at Freedonia Custom Research can help you gather both primary and secondary data for your business needs. We have access to The Freedonia’s Group catalog of 3,300 industry studies, Kalorama and Packaged Facts, and 600 Focus Reports, giving us a significant head start on secondary data collection in terms of market size, growth rates and competitor information. That’s information we can begin to validate and refine in the course of primary research, and because many industry participants are familiar with Freedonia’s research, they’re eager to talk with us about their business. Thanks to years of conducting primary research with decision-makers and influencers across industries, we’ve developed a long list of contacts we can reach out to for in-depth interviews and surveys. We know what sorts of questions to ask various constituent groups (such as manufacturers, distributors, end-users, industry associations and regulatory bodies), and because we are an independent, third-party firm, you can trust that their answers will be candid and unbiased. Not only do we know where and how to find all the data needed for a successful research project, we know how to bring it all together so that an abundance of data points is transformed into meaningful and actionable insights for your business. We cross-check pieces of information against one another to identify both trends and outliers, ensuring you get a complete and accurate picture of the industry. If you’d like to learn more about how Freedonia Custom Research can help you navigate a sea of data, please contact us at 440-684-9600 or request more information on our website. A must-read for business professionals, The 5 Keys to Estimating Market Size for Strategic Decision Making explains how to develop a reliable market size calculation. This white paper is written by experts at Freedonia Custom Research. Click the button below to learn more and download the PDF. Which Market Research Report: Primary or Secondary?